There’s a part of Ireland still untouched by the 21st Century, where the Celtic Tiger’s roar was only a distant echo. So Gerard Barrett’s feature debut Pilgrim Hill shows us. We follow the daily life of rural farmer Jimmy (Joe Mullins) as he goes about his pastoral chores – if it weren’t for the Oreos stacked on the local shop’s shelves or his unemployed young friend Tommy’s (Muiris Crowley) shiny Beamer, Pilgrim Hill could almost be set in the 1950s. Eschewing the high drama of John B. Keane’s The Field, Barrett’s story takes a more real and reserved approach, as it slowly but steadily reveals the wearying effect the world takes of Jimmy. He cares for his cows like family, even though in his own words they are barely pets. He looks after his stroke-addled father – never seen but ever present – but wishes he didn’t have to. Even his rare trip to the pub is a miserable one; a single pint sipped alone so as not to go over the legal limit. The only real energy in Jimmy’s life comes from the rhythmic pulsing of the milking machine; the rest is silence. The film is punctuated by a series of almost-to-camera interviews with Jimmy, whose shyly averted gaze says as much as his words. These are great insights into the character, who has never truly bloomed as a person, and they allow Mullins to really get into Jimmy’s skin, but one can’t help but wish there was a more inventive way Barrett might have opened up this character to us. The steady pacing of the story is accompanied by tidy, withdrawn framing that keenly demonstrates the isolation of the character, marred by some unfortunate lapses of focal depth. Jimmy’s house is littered with items from the life he might have lived – a Rod Stewart mug and a pair of polka-dot purple underwear reveal a side to the man that we will never hear from his lips. As life takes increasingly cruel tolls on Jimmy, Barrett’s film becomes a study of how much a man can take before he breaks down and cries. Does healing come with tears? Unambitious but well executed, Barrett reveals himself a filmmaker to keep an eye on, while Mullins, a sometime theatre actor with no prior features under his belt, carries the weight of the film with a sincere, world-weary performance, taut with closeted emotion. Pilgrim Hill is an honest portrayal of a fragment of Ireland we all too eagerly like to pretend we have left behind us. So the Jameson Dublin International Film Festival has been over a week now but it’s worth recapping what I saw in the days following my marathon Sunday viewing. On the Tuesday of the Festival I caught the entertaining oddity Were the World Mine. A camp indulging in gay teen wish fulfilment, the film combines traditional teen angst drama with musical fantasy to create a bizarre yet recognisable fusion. Loosely autobiographical, according to director Tom Gustafson, the story follows a troubled gay teen dealing with his attractions at an all-boys school in a somewhat conservative American town. First escaping into daydreams about his rugby star crush – the film’s portrayal of a daydreaming adolescent is commendable – framed in the context of a school performance of A Midsummer Night’s Dream, the film takes an interesting and utterly unexpected turn when the youth, Timothy, successfully fabricates the love potion from that play, and uses it to help the world see through his eyes, by literally making the whole town gay. It’s a little juvenile, but it’ all performed with a nod and a wink, and it pretty much works fine as an indie comedy. Whether it truly has anything to say about gender relations and sexuality is debatable, but through the use of dance and music, all lyrics by Bill Shakespeare, it certainly sets itself apart from any similar films. Certainly it’s the freshest the love potion film has seemed in decades. Right after that, though thankfully in the same cinema, was a gala presentation of the sensational Il Divo. 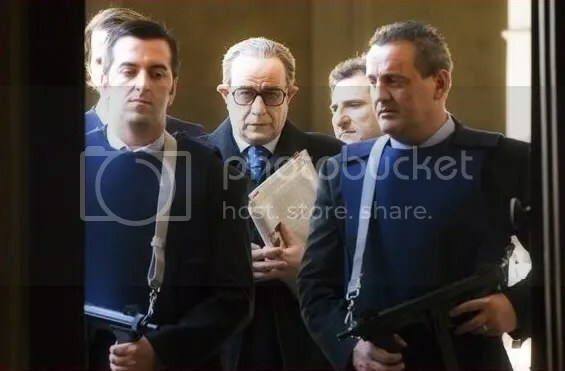 A political biopic like none I have ever seen, the latter days of the rule of Giulio Andreotti are played out in manner that could be called part drama, part gangster movie, part music video. Indeed, the impressive young director Paolo Sorrentino said in discussion after the film that his intention had been to create a “rock opera” about Andreotti, and it very much comes off that way. Surreal flourishes permeate the otherwise sensible walls of power in Rome: a cat with David Bowie eyes engages Andreotti in a staring contest; blood red subtitles introducing characters shift within the frame to contest with camera movements; even the music from the soundtrack is utterly eccentric. As Andreotti, Tony Servillo creates a caricature that feels too strange to not be real. There is an inhumanity to him, as he rings his hands, hunched like Count Orlok, and yet when we see his relationship with his wife, and when we see the pressure that is on him and the sleeplessness power creates for him, we realise that it is far more than a caricature that is on display here. In perhaps the film’s most startling image (and there are several in contention), Andreotti walks off his sleeplessness up and down a corridor for what feels like minutes on end, the camera swinging to keep up with movement as he darts in and out of focus. There is a potential master behind this camera, but like many of the masters he is clearly really having fun. A complete antithesis to the realism of Italy’s other Cannes success last year, Gomorrah, Il Divo similarly asks questions without answers and leaves an incredible amount of ambiguity, while pointing towards Andreotti’s guilt. It’s a bizarre experience, but one that you can’t shake off afterwards as you still picture Andreotti shuffling along the midnight streets of Rome with an armed cavalcade of police at his side. The next evening was the Irish premiere of Religulous, another feature long out in the US, which I had been waiting for for some time. I’ve never made much secret of my staunch atheism so this was always going to be a case of preaching to the choir (if you’ll forgive that specious turn of phrase in this instance). I’d be lying so if I did not admit I was slightly disappointed. The film took what I consider to be too flippant an approach in its observances of the faults in adhering to outdated religious doctrines. To finally turn around as Bill Maher does in the final reel and put forth what amounts to a call to arms for atheists and agnostics is quite a step that one feels a whole TV series would have required rather than 100 minutes of witty analysis. In fairness, as comedy goes, making fun of religion is like shooting Jesus fish in a barrel. But that’s not to say it isn’t funny, it has some great moments, mostly supplied by witty subtitles and bizarre interviewees. The discussion with an eccentric priest outside the Vatican contains many of the highlights, as does the interview with an Arkansas senator. But good fun and occasional insights do not make it the must-see event it really should have been. The surface has been scratched, but who will start hacking away now that Bill Maher and Larry Charles have retreated? An exhausting dash from Cineworld to the Screen (again) made me very on time for a delayed screening of Tokyo!, coupled with Il Divo my highlight of he Festival. This three-pronged assault on logic through surrealism and whimsy is one of the best collections of short films I have ever come across. The first film, Interior Design, has left me forgiving the bitter taste Michel Gondry left in my mouth with the dire Be Kind Rewind. It is an expertly crafted story that begins as a generic but pleasant “country girl in the big city” story before mutating into a Kafkaesque nightmare with a happy ending. The story of Hiroko’s (Ayako Fujitani) struggle to feel useful and her despair in realising the truth about herself is captured wonderfully through the film’s pacing and Fujitami’s introverted performance. When all surrealist hell breaks loose, Gondry uses his trademark “wait, how did he do that?” special effects so brilliantly that it sweeps you up and takes you away with it. The ending hovers in a void between meaningless and insightful that all you can do is smile. Merde is the weakest of the three vignettes, but that is hardly a criticism. Directed by little-known French filmmaker Leos Carax, it tells the story of a horrible French troll (Denis Lavant) who lives beneath Tokyo, venturing forth only to terrorise through sheer unpleasantness. The first elongated take following Merde along his path of terror, on what feels like a never-ending or endlessly repeating shopping street – stealing money (to eat) and licking helpless passersby. When eventually captured and put on trial, his lawyer appears to also be a similar troll creature, albeit one who has become a respected member of French society. Pythonesque comedy ensues as the two communicate through gibberish; it nearly gets old but always remains funny, even through the lengthy courtroom scene, which is kept fresh by the use of – for no discernable reason – 24-style split screens. It’s all very silly but very fun, with brilliant fake news coverage adding to the nonsense. The final gag is truly inspired, although one fears Carax could follow up on the offer it contains. Finally, Shaking Tokyo is Tokyo!’s triumph. From Bong Joon-ho, the Korean genius behind the genre-bending The Host, it tells the story of a hikikomori, a sort of homebound hermit, who only orders in food and refuses to make eye contact with visitors, and designs his dwelling with used-up toilet rolls and empty pizza boxes. After a chance encounter with a beautiful woman and a subsequent earthquake, the nameless shut-in begins to rethink his life, and the story ventures from comedy into the worlds of romance and science fiction. It is an utter delight with more than enough quirky gags to keep it constantly fresh, as well as one of the most charming voiceovers in recent memory. On Thursday night I took a friend to see Two For the Road, playing as one of the many classic films on show. As an extra treat it was on at the Lighthouse cinema, which I had not been to since its reopening last year. It must be the comfiest and most aesthetically pleasing cinema in Dublin. The film was more of a treat than I expected, detailing the romantic ups and downs of an English couple over 12 years as their various holidays in France criss-cross one another in time. The back-and-forthing feels remarkably novel for 1967, it’s the sort of stylistic device we like to think belongs solely to the likes of Christopher Nolan. But really this is all about the magnificent script (by Frederic Raphael) and the impressive chemistry between Albert Finney (utterly charming) and Audrey Hepburn (who goes from pretty pixie to bitchy madam). Some of the sequences work better than others. The youngest pairing are so full of promise (that we see simultaneously blighted) that it’s hard not to love them, and their dialogue is so laced with double entendre that it is always hysterical. Another pairing sees them travelling with an infuriating American couple, who you wish to both laugh and strangle they are so totally true-to-life. But the eldest, successful and bitter sequences are so nasty, and Hepburn’s outfits so gruesomely over the top, that they never quite work properly. Especially toward the end, where the film loses its sense of rhythm and extends each scene needlessly, that by the finale you feel utterly exhausted. It is still a film years ahead of its time however. So after what felt like an almost faultless run at the Film Festival I took my chance on an Irish film for my last night, the Saturday, when the director of Song For a Raggy Boy, Aisling Walsh, presented her new film, The Daisy Chain. A horror (sort of), in the vein of Rosemary’s Baby, the film defiantly chose not to work. Beginning promisingly with the journey of a young couple, played by the usually reliable Samantha Morton and Steven Mackintosh, to his former home in Co. Mayo as they expect their second child, following the death of their firstborn, the film quickly misses its footing with an overindulgence in twee Oirishness and hammy acting. A local girl, Daisy, whose face is inexplicably always dirty, is cruel and odd, though friendly towards Martha (Morton). When her entire family ends up dead, no one suspects a thing and the newcomers to town take her in. Despite her being really creepy. Suddenly people start to whisper that she might not be human, and might actually be a “fairy changeling” (watch in horror as the cast clearly hold back giggles while saying those words – you might not be so lucky). The defence comes from Martha that she is probably autistic, but that just raises further questions as to why on earth this couple are left looking after her. There are a few good sequences: Daisy – who, played by newcomer Mhairi Anderson, is genuinely impressive in her creepiness – nearly pushes some local children off a cliff as she violently demands they “Play with me!”; a crazed local attempts to do away with the girl in a rather fiendish Wile E Coyote-style pit trap, but even that whole scene is spoiled by a slow motion shot that looks as if it was created with the free software that comes with a new MacBook. The film is riddled with errors. Continuity errors, editing mishaps, hapless dialogue. When Daisy’s parents die, a garda says that the locals wouldn’t be so scared if it hadn’t happened on Halloween, which is the first we’ve heard of this! A number of subplots pop up without purpose, including a sequence of marital infidelity that comes from nowhere interesting and goes nowhere at all. It’s sloppy work, which is a shame because it has merit – it is wonderfully shot in some impressive Irish countryside locations, Morton and Anderson both pull off their roles, and Daisy is genuinely unsettling. But it all builds up to an open-ended climax that reveals that even the writer had no idea how to end this. There isn’t even a theme, in two charming early sequences a crucifix is referenced (bringing to mind if nothing else The Exorcist), implying that there might be a theme of old beliefs versus new, but this never fully materialises. By the end of the film the only moral on show is that autistic children should be culled before they kill us all! It was a dreadful end to what had otherwise been a terrific week of solid film viewing. Here’s looking forward to next year, when hopefully I’ll be able to take a more active role. And perhaps I can take in a few more festivals in the interim.